Here is the last picture taken by New Horizons on 7-13-15 prior to today's 7:49 a.m. EDT closest point of approach (see my previous blogs). We will not know for certain if the New Horizons spacecraft successfully completed its scheduled flyby of Pluto until about 9 p.m. EDT tonight - 7-14-15. That is when the "thumbs up" signal scheduled for transmission at approximately 4:30 p.m. EDT will be received. It will have taken 4 1/2 hours for that radio signal to reach Earth 3+ billion miles away traveling at the speed of light - 186,000 miles per second. The spacecraft has maintained radio silence during the flyby in order to concentrate on data acquisition. It will take 16 months for all of the flyby data to be transmitted and received by Earth. The transmission rate is only 2,000 bits per second - painfully slow due to the immense distance involved. We will hopefully receive the first flyby photo tomorrow, 7-15-15. Pluto is now a WORLD we have visited for the first time in history with a robotic emissary...something that will never happen again. It is not likely we will be this way again any time soon. 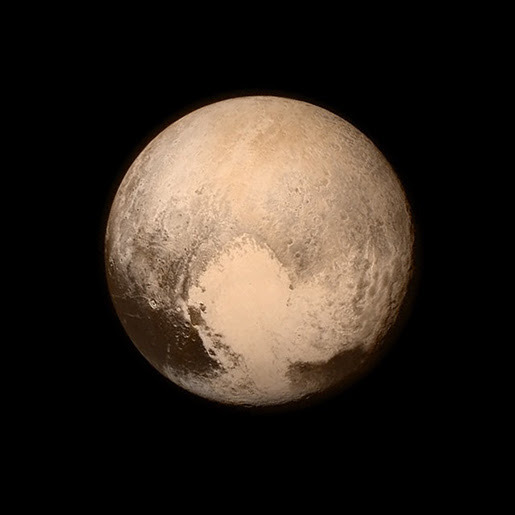 New Horizons is now leaving Pluto behind and perhaps heading to a new mission to visit another world if approved.